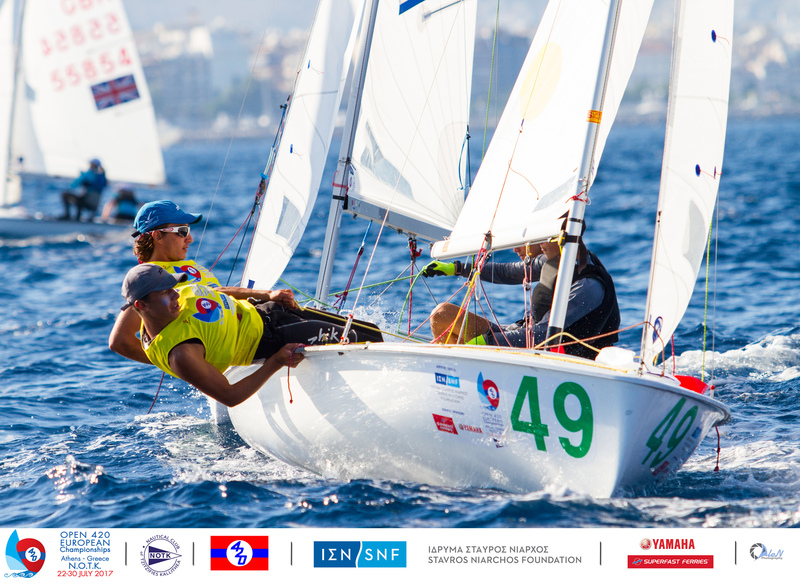 The penultimate day of racing at the 420 Open European Chanmpionships in Athens, Greece, was a tussle for leaderboard points. 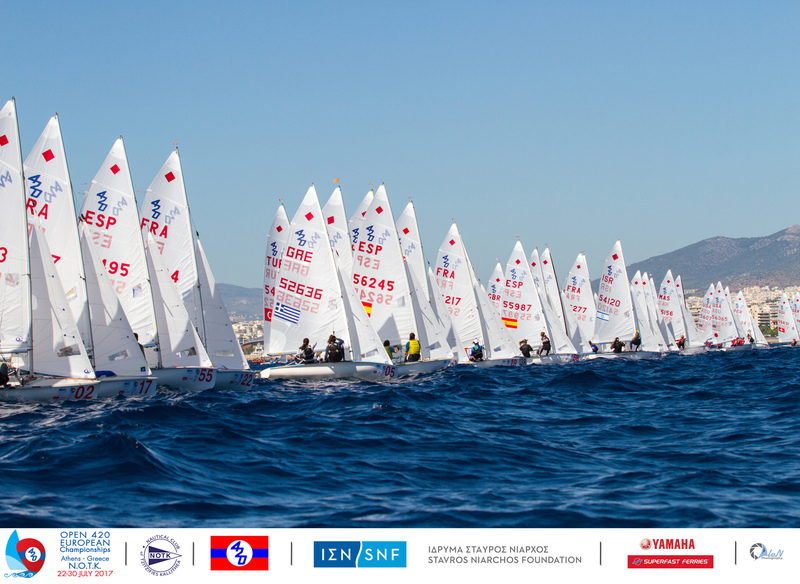 The breeze filled in with a southerly at 14-16 knots and again challenged teams with differences in pressure and wind shifts around the track. Saturday’s two races were all about consolidating and defending places, and for those still with a chance of climbing up it was a day to take a risk and push forwards. 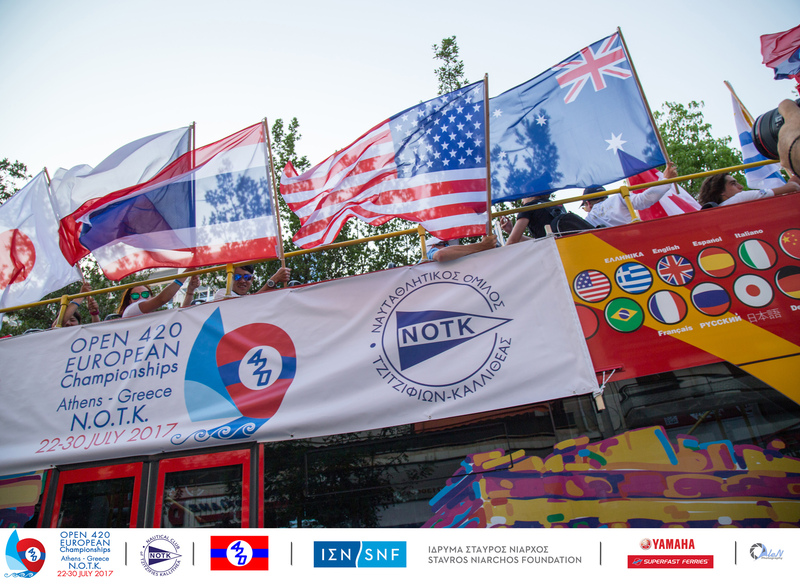 Sunday's medal deciding races are scheduled to get underway at 1300 hours. 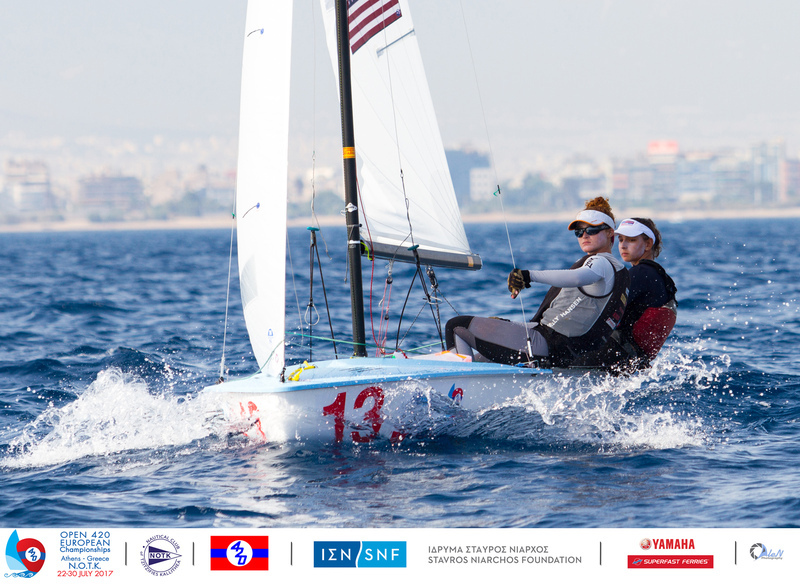 Having dominated all week, the USA’s Emma Kaneti/Ciara Rodriguez-Horan fell on their sword today, over the line in race 9 and, perhaps unseated by that outcome, then scored a 24th and plummeted from 1st to 4th. Overnight the pair will hopefully assess their day, get back into focus of what they know, have proven they can deliver so far and will come away from the Championship with a deserved podium finish. 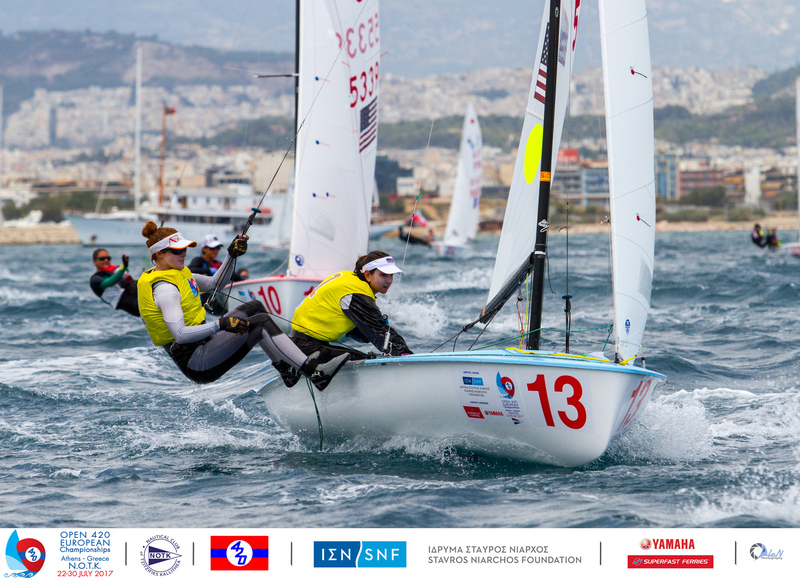 With the Americans unseated, Spain’s Maria Caba/Pilar Caba swiftly took over the yellow leader bibs scoring a 10,1. Whether the Spanish team will still be wearing them by the prize giving is anyone’s guess, as the points margin behind is nerve rackingly close. 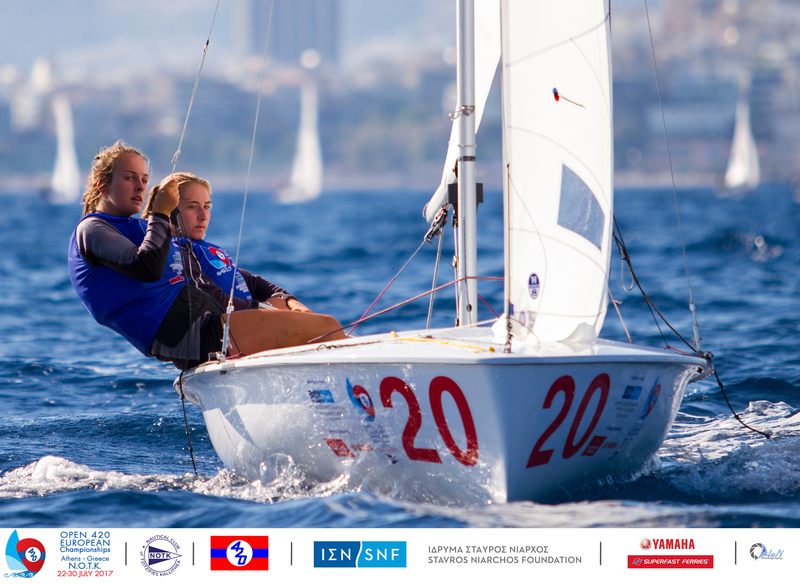 The 2015 420 Ladies World Champion, Marta Garrido (ESP), competing with crew Clara Llabres, is just one point behind her teammates and holds a better discard score. So any mistake by her rivals ahead and you can bet, despite her fun-loving demeanour, the vastly experienced Garrido will be ready to pounce. 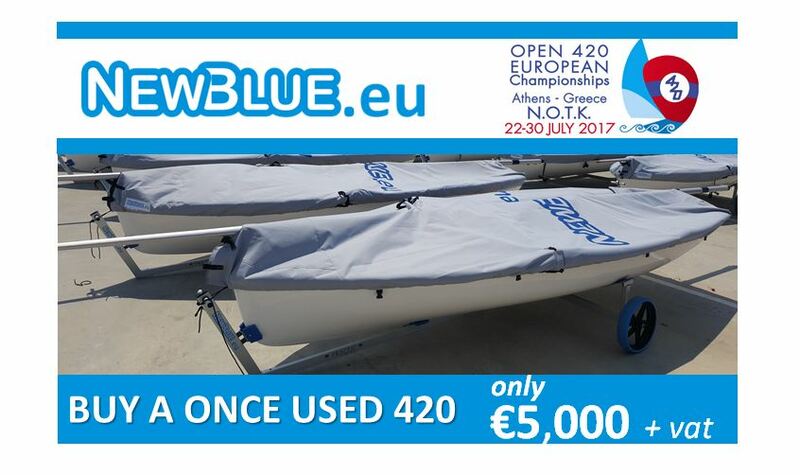 Garrido acknowledges the conditions here at the Europeans have been tough, and that from the mouth of a sailor with over five years’ experience at 420 Class events and Championships, and a couple of years in the 470 Class. 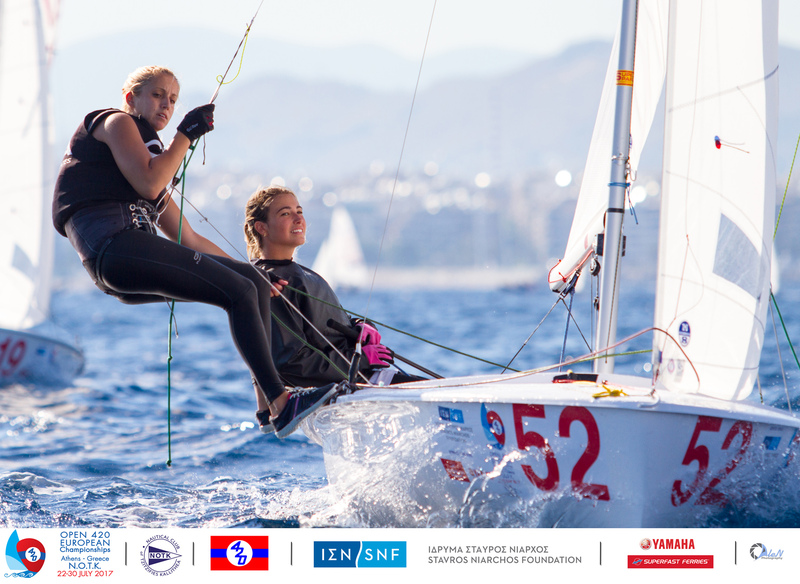 The opening race win of the day went to Great Britain’s Hatty Morsley/Pippa Cropley, their second of the series, but a rollercoaster scorecard holds them in 11th. 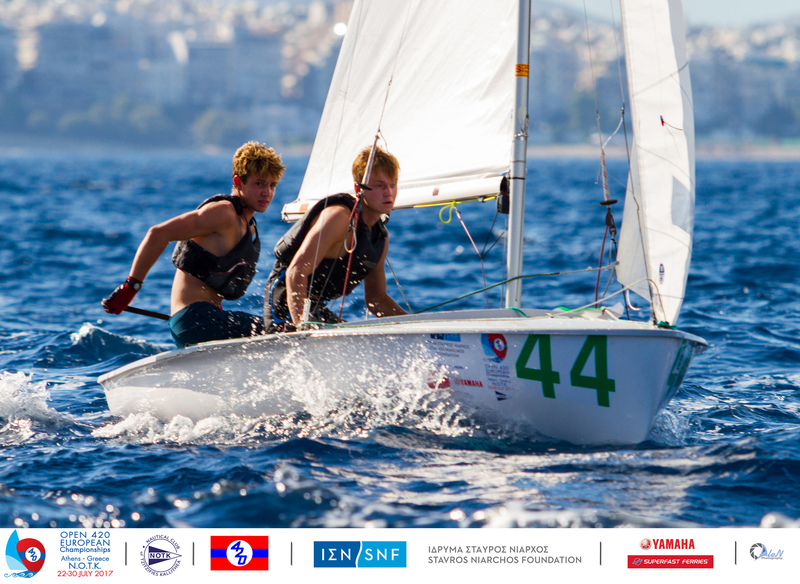 Two more consistent results tomorrow though should see the pair secure a top-ten finish. 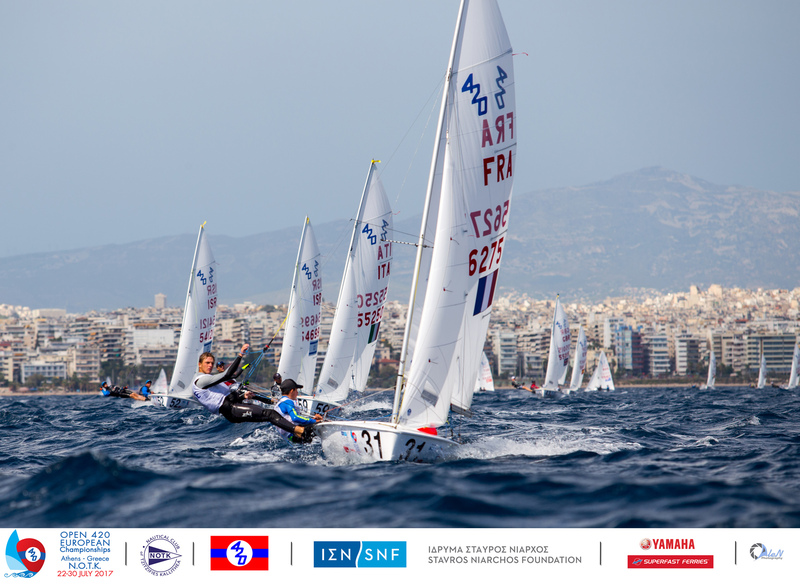 Similar front of finish fleets, compared to an otherwise up and down series, went to Israel’s Linoy Korn/Omer Bilia, who finished second behind the British, and Italy’s Laura Selvaggio/Camilla Fassio in third. Down but not for long! 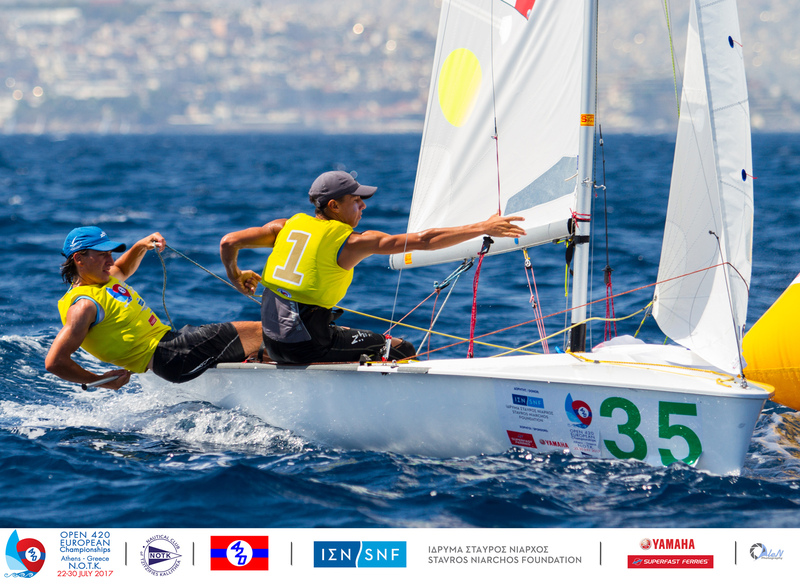 Yesterday, Italy’s Edoardo Ferraro/Francesco Orlando lost their lead, today they return with a vengeance. Behind are the same four teams, but just in a different order. 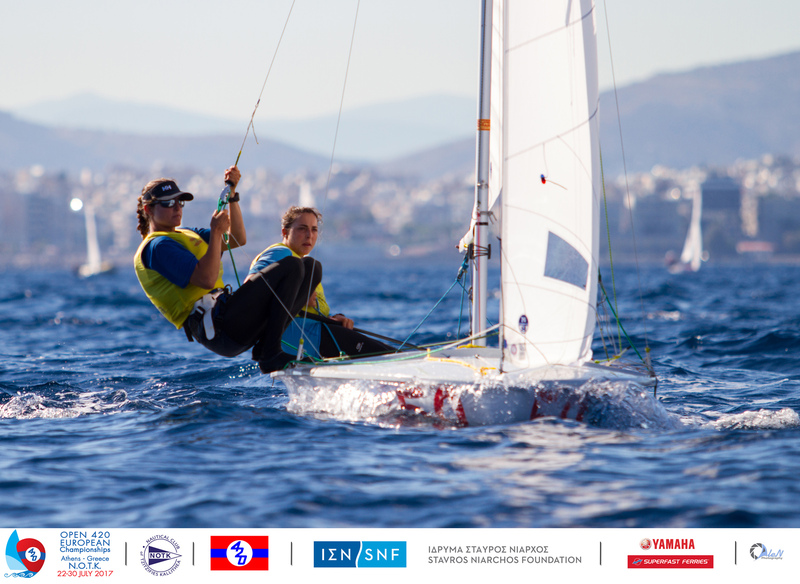 The fight is finely balanced, and the Italians look set to be in a duel to the end in a spectacular showdown with the reigning U17 World Champions, Telis Athanasopoulos Yogo/Dimitris Tassios (GRE). 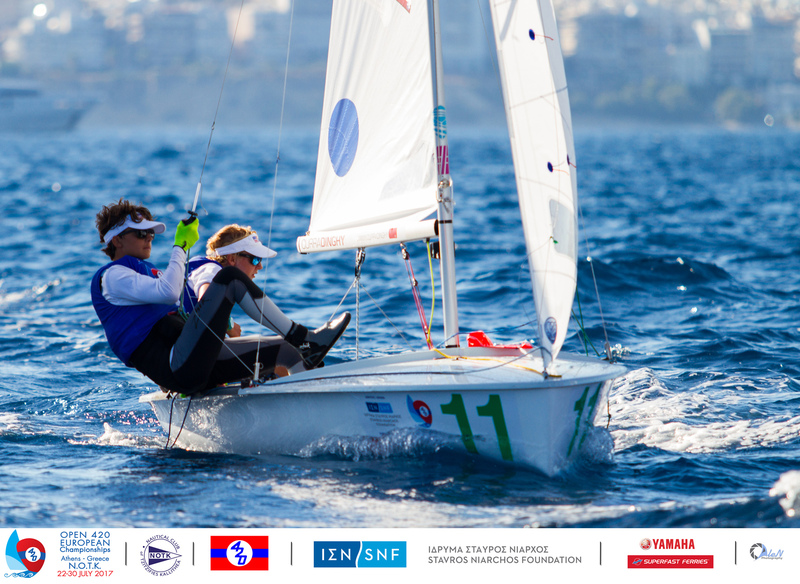 They are both very comfortable with the challenge and pressure for medal outcomes, but if they get too wrapped up in their own battle, the opportunity will soon open for one of the chasing teams to breakaway out front. And, amongst those hunting down the Italian and Greek teams are Spanish brothers Lucas Pares/Teo Pares who are extremely close behind in third. 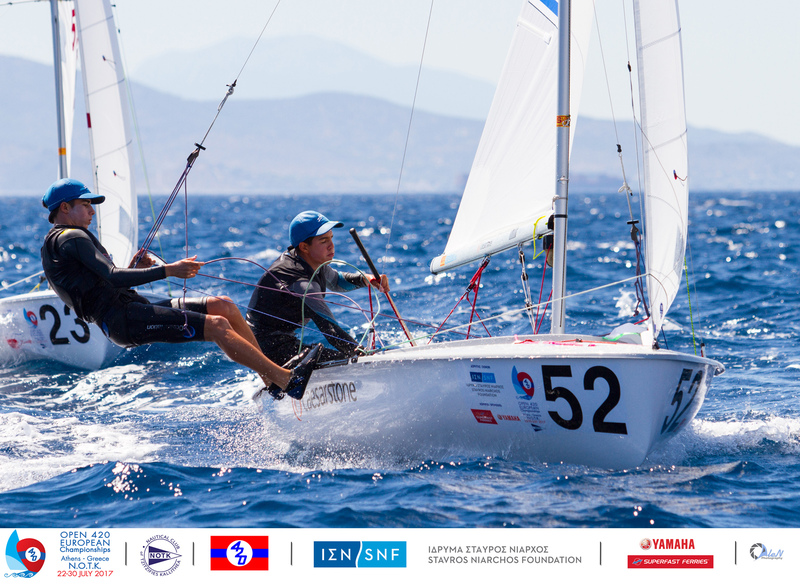 Israel’s Tal Shariti Sade/Noam Homri also put themselves closer to podium contention, upgrading from 5th to 4th overall. 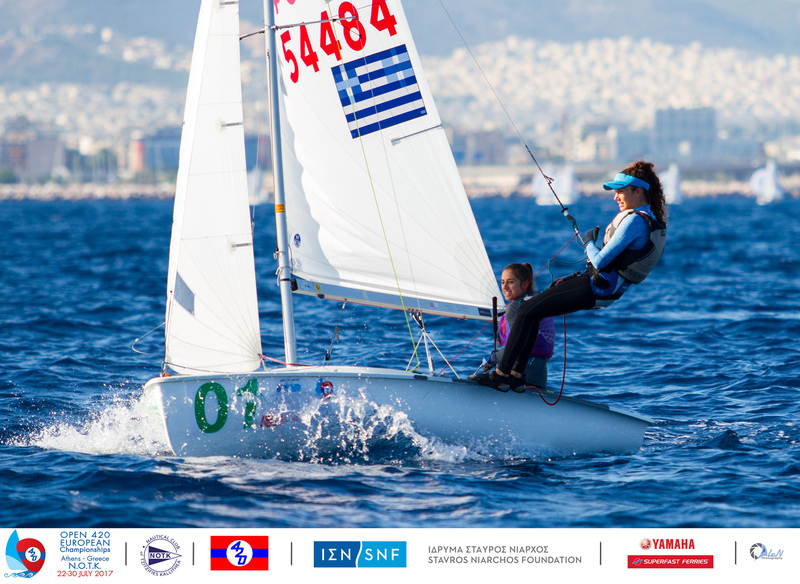 The pair are in their first year sailing a 420 and competing in their first event outside of Israel. 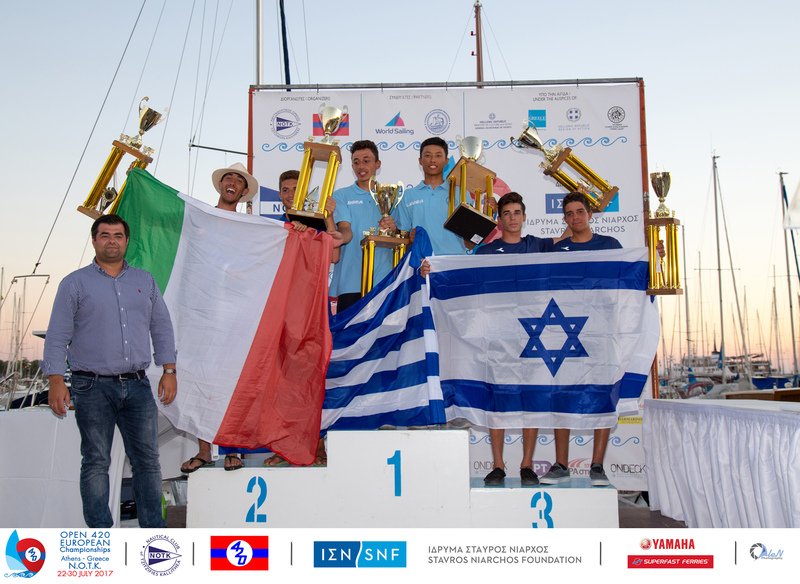 Demetrio Sposato/Gabriele Centrone (ITA) have led the under-17 fleet since day one and clearly have no intention of letting go. 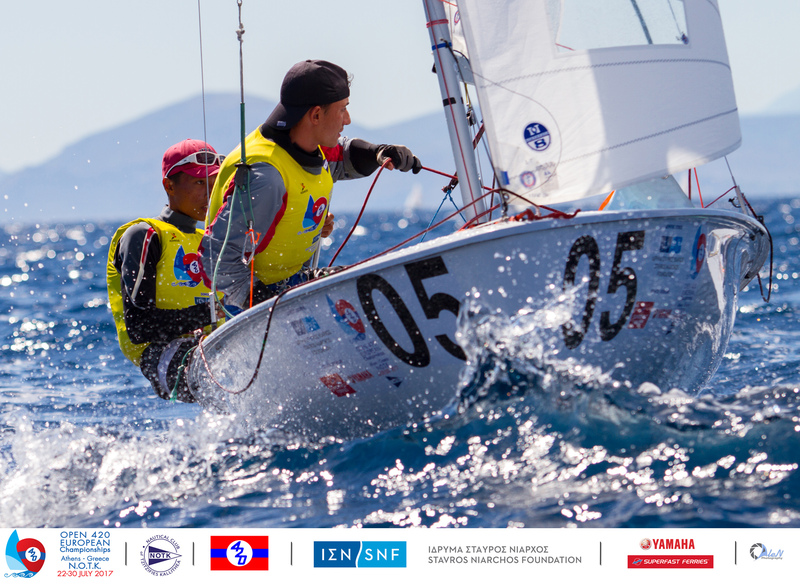 Their advantage is 28 points, their worst score is 9th, apart from their discarded 20th place finish in race 8, and the stage is set for them to claim gold tomorrow. There is no reason to doubt the ongoing performance of the Italians, but instead to watch what unfolds behind. Same four teams just a change in positions. 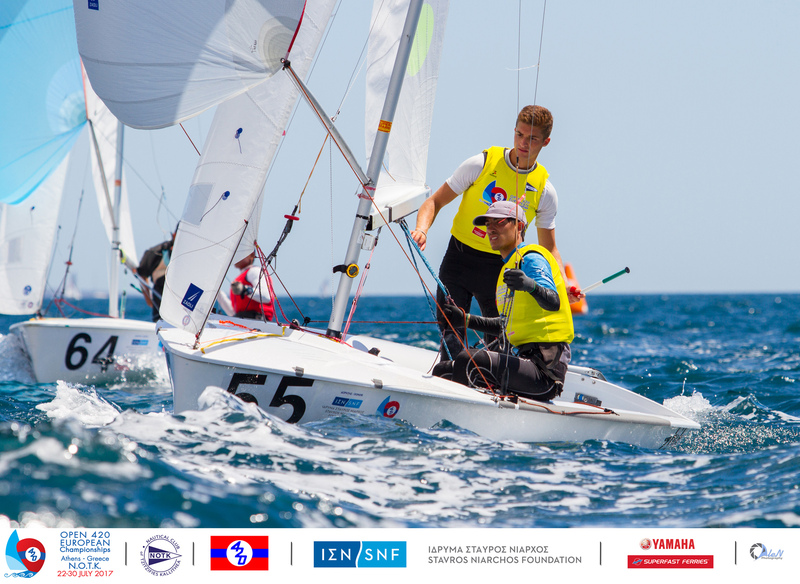 The Spanish pair of Martín Wizner/Pedro Ameneiro today overtook America’s Max Anker/Leyton Borcherding, with Rhys Lewis/Drew Wright dropping to 4th on tiebreak, and the top ladies team of Ariadni-Papaskevi Spanaki/Myrto Papadopoulou holding firm in 5th just a couple of points behind. Sunday’s concluding two races are going to be particularly interesting in a battle to the end. The margin between these top 5 teams and 6th place is 34 points, so a realistic prediction that the medallists sit amongst these faces.